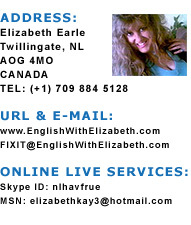 English With Elizabeth › The Expletive Conundrum: To use or not to use? I have come upon this question more often than you might think. Coming from a Christian background, I've struggled with the moral dilemma of either banning all nasty words from my writing, or throwing caution to the wind thus putting my writing and it's content first. Neither has worked too well I must admit. There are times when only a shocking word will do, in order to bring a story alive or express a certain strong feeling about somebody or something. What I have discovered is that there's a fine line between proper versus improper in regards to colorful language within writing. There are most certainly some words that are acceptable, and if used skilfully, will not insult any reader. And as with everything, this works the other way round - there are lots of crude and rude words that will cause potential readers of your work to throw down your creation in disgust, vowing never to pick it up again. This is what you want to avoid! I finally settled on the concept of searching for a replacement word which carried the same definition of the no-no word, without having my writing suffer a case of the dull and boring blahs. It takes a little creative thinking and improvising, but it is possible to do. For example, sometimes I'll invent a bit of a expletive when there's not a suitable alternate for the original nasty one. As in "What the fuddy-dud are you saying!!" or.. "You are fizzing me off!!" or.. "Go to Pell Mell!!" This method definitely carries the enormous punch you are striving to achieve, without insulting anyone by a blatant use of corrosive and controversial language. And the bonus is a tidy sum of smiles rather than a flock of disapproving frowns. Of course it's a personal choice whether an author chooses to be discriminate or indiscriminate when it concerns the use of expletives. As for myself, it doesn't intimidate or rile me a scrap when I read less than gentle language in an interesting novel, but not everyone takes this blasé attitude. As I said, there is a fine line between what's acceptable and what is considered trashy or filthy and inturn will infringe upon someones personal ideals and morals. It is not a good idea to write freely without some measure of decency and respect for your readers, in any language. Actually there are plenty of words that are banned from public television channels, and MUST be bleeped out by law. Without listing a multitude of these unrestrained explicit words, I'm sure you'll have little trouble guessing which ones they are! For example "Oh my God!" will never get the heave-oh from a TV program, but just about any other descriptive word used in place of God will never survive TV customs! So, in summing up - Expletives: To Use or Not to Use? - Be your own boss/employee all at once, but it's the boss who MUST ensure that the employee is well informed regarding the repercussions relating to the use or non use of derogatory words and terms! Confusing? Not at all...just give it a whirl!